1. 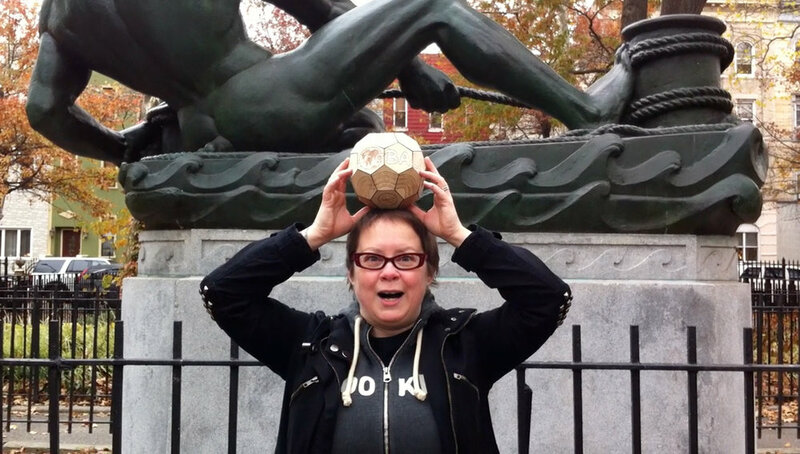 Take a picture of yourself with the GLOBALL and send it to wheresgloball@gmail.com. Please include your FIRST NAME, ADDRESS or GENERAL LOCATION, TIME and DATE. 2. Once we get your information, we will ask you a few awesome questions about who you are going to give the GLOBALL to and what they mean to you. With your permission, we'll share your story with the world! Those stories of connection are what GLOBALL is all about! A. You must give the GLOBALL to a VERY GOOD FRIEND. B. You CAN NOT MAIL the GLOBALL. C. You CAN NOT SELL the GLOBALL. D. The GLOBALL Rover should be passed within 30 days of receiving it. Doing A, B or C voids your participation! My buddy Holly with the first GLOBALL maquette. GONE? If the GLOBALL Rover is lost, find it! If it is stolen, go get it back. Email me with the story as soon as possible! AIRPORT CUSTOMS? If it is held up at an airport, please know that it has been treated with non-toxic wood petrifying materials that made it acceptable to export by the United States Department of Agriculture (more information can be found in the traveling case). Other countries may have different standards. If it is held up, get all the necessary paperwork, make sure it left in a safe place and contact us immediately.